Released in 2002, Reign of Fire is an action fiction movie set in a post-apocalyptic time where dragons have reduced the human population to near extinction. The movie was able to gross around $82 million from spending a production budget of $60 million. 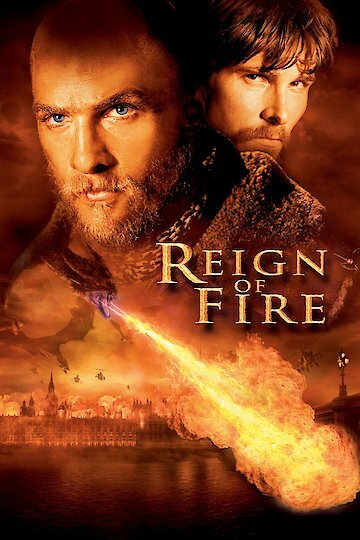 Reign of Fire was shot in three different locations including the US, UK, and Ireland. It runs exactly 101 minutes and stars Christian Bale, Matthew McConaughey, and Gerard Butler. The plot begins in the new millennium when the construction of an underground facility in London is taking place. The workers unfortunately dig too deep, awakening a massive hibernating dragon. The beast unleashes a deadly breath of fire that instantly kills the workers. The only survivor is a young lad named Quinn Abercromby. Quinn's mother, Karen, was the crew leader on the construction project and was killed while protecting her son as the dragon made its way to the outside world. Years later, the dragons have nearly wiped the entire human race and has turned the lands into burnt and ash fields. They've spawned rapidly and have outnumbered the humans. It is later revealed that dragons have been instinctively and strategically hibernating to hide themselves while the earth's population repopulated, so that the creatures had enough food supply. Various scientific studies and researches also concluded that dragons were the ones responsible for dinosaur extinction. Now faced with the same threat, humans attempt to survive their winged adversaries. In 2020, Quinn Abercromby has grown up and has formed a community comprised of survivors. They are mainly based in a large castle in Northumberland. The survivors, however, starve as they wait for crops in a nearby field to ripen. While most of the survivors trust Quinn, some have become restless and unreservedly disobedient. One night, while everyone is sleeping, a group of survivors steal a vehicle to harvest crops in the nearby field. While harvesting tomatoes, the group is bombarded with fire blasts by a dragon. One of the group members is burned and the rest are trapped in fire. They are saved by Quinn and his men including Creedy, his right hand, and Jared. Quinn and his team use specialized fire engines and fire gear to avoid getting burned. Another survivor gets killed while controlling the water cannon. The others escape when the dragon subsides and allows them to go. The crops, however, are destroyed, leaving the village in danger of starving to death. Reign of Fire is currently available to watch and stream, download, buy on demand at Amazon Prime, HBO NOW, Amazon, Vudu, Google Play, iTunes, YouTube VOD online.